The first-ever book to offer an in-depth analysis of images and objects relating to the greatest sports show on earth is published this month by an art historian at the University of Bristol. 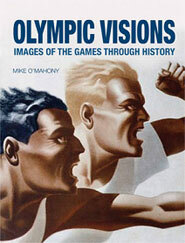 Olympic Visions by Dr Mike O’Mahony examines a fascinating array of visual materials that have been made to advertise, celebrate or commemorate the Games, ranging from paintings, drawings and sculptures to documentary film and photographs, posters, mascots and medals. Every Olympic festival has its own exciting and memorable moments, many familiar to us through television images or the iconic photographs that celebrate them. But each Games also generates a wide variety of art works. This book explores how poster artists, filmmakers, architects, designers, painters and sculptors have contributed to this unique global sporting event from the first staging of the modern Olympic Games in 1896 to the present day.